Well, we’re down to two large fans running 24 hours a day as most of the basement is now dry. We have one stubborn spot that was still showing 60% moisture (they use an electronic meter) that needs to come down. The day before we had places that were 100%! In Colorado, you need to be below 16% for mold not to grow so that’s our goal. Everything else in the basement is 0% except for a few spots that are around 8-10% that will dry out on their own. Today we’re taking Mojo to doggie daycare and will head down to Big D late tonight after work. Tomorrow, and maybe tonight, we’ll see G’ma Dix and have dinner with her, Greg and J (Dixie’s cousins or nephew or something) and then drive back home late tomorrow night. We have a big week next week and I have to go to Seattle so lots going on. 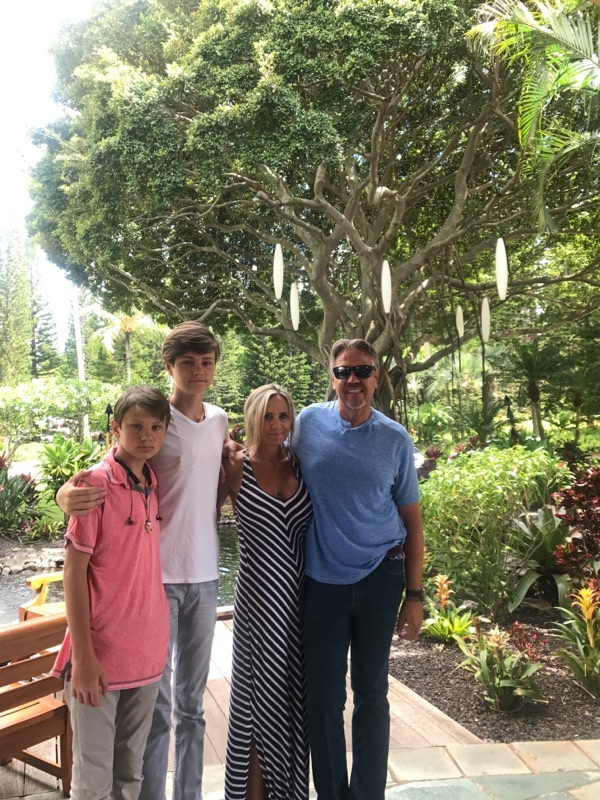 Here we are below on our last day in Hawaii and even though it looks like Jag is taller than me, I’m leaning on one hip doing my “picture pose” so he’s really not! Lori says he definitely is, but I keep telling myself he’s not, ha. One things for sure, Lori is now officially the shortest one in the family as Ty is taller than her even if this photo doesn’t quite show it, so ha! I guess it’s raining in Denver but it’s nice up here, a bit cooler today, but still blue sky and nice. I’ve been on the phone all morning and Tommy reminded me to write the blog. I need to run though as I have a doctor appointment in about 45 minutes. I might not go though as Lori called and asked if she could take my appointment for a patient who needs cardio clearance before surgery on Monday. I was going in just for an annual check up so no big. Not sure if she still needs it or not. That’s about it for the day, hope everyone is well, take care, be safe and God Bless.